A Basketball Training Program can give a player a huge boost of confidence going into tryouts. Not that many players make the commitment. Stand out from the crowd by being ready with a basketball training plan that works. Get your body and mind ready for the season ahead. 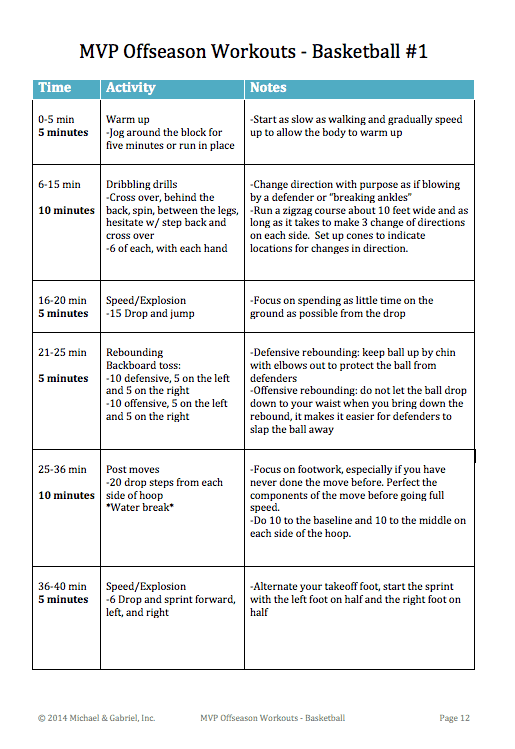 What’s in this basketball conditioning plan? Illustrations to help understand activities and an appendix with more detailed explanations on drills. Designed for either a 6 weeks time period with 3 sessions each week or a 9 weeks time period with 2 sessions each week. Players who play another sport in the offseason frequently find the 9 weeks time period works best. Life lessons like never quitting, overcoming obstacles and the power of persistence are reinforced. Information young basketball players should know. MVP Tips. Includes insider secrets to rebounding successfully, targeting your shots (aim small, miss small), shooting free throws more effectively, the importance of the first dribble, and many more. * Why are the workouts 66 minutes in length? Most basketball players don’t do enough offseason workouts at all. The players that do practice typically practice for about one hour. By completing 66 minute workouts, players using this program are investing 10% more into their game. This can translate into much bigger gains come the regular season. 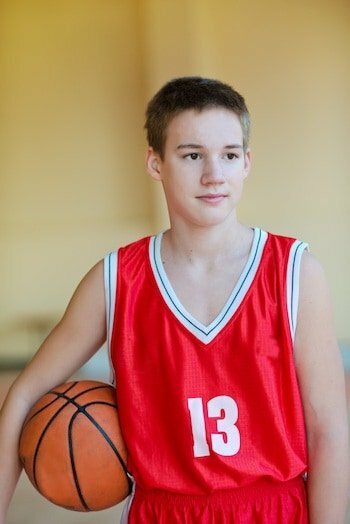 Basketball players ages 10 – 17 years-old. Both boys and girls. 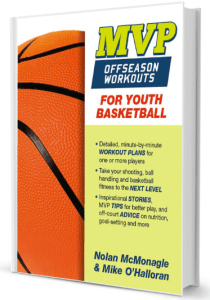 Recommended for players who have played organized basketball before. Why basketball offseason workouts are important? Repetition of an exercise builds muscle memory. By focusing in on individual skills during an offseason workout, a player gets plenty of opportunities to fine-tune those skills and really improve upon them. You’re learning a process not just for the season ahead, but for the basketball season in front of you. Do it the right way. No waiting. You can accomplish a lot in a little time when it’s just the player, the hoop and the basketball. There are no lines when you practice by yourself. This basketball training program will give you lots of repetition – a season workout that you can come back to time and time again. Your team’s coaches don’t have enough time to devote to every individual skill. Regular season games usually present too few opportunities to hone a skill. 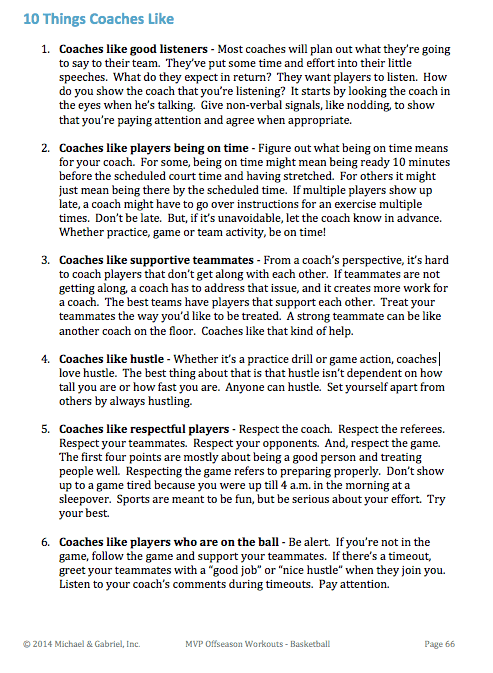 Practices during the regular season provide more opportunities, but typically a coach has many other topics to cover. Let’s say a player wants to work on their up-and-under post move. A game might provide just 2-3 opportunities to try this shot. The topic might only be covered once at one team practice and a player might work the move into some scrimmages. However, an offseason workout might include dozens of opportunities weekly to work on this move. Lots of reps lead to improvement. Breaking down the bigger game into smaller components makes it easier. If a player just scrimmages, scrimmages and scrimmages; that player will likely get better at basketball. If that same player takes a different approach by scrimmaging some, but also putting concentrated effort into improving some of the fundamental basketball skills, it’s likely that the player will improve at a much more rapid pace. Provides a platform to strengthen weaknesses and build on strengths. Individual workouts can be tailored to work on the areas specific to a player’s strengths and weaknesses. There is plenty of time until the next game. Working on your shooting stroke during the season can be difficult. By working on shooting during the offseason, corrections can be made, and lots of practice can take place prior to a game situation. It’s the ideal time to work on shooting. It’s a relaxed environment where no one is watching. Individual workouts enable players to take lots of risk with no fear of evaluation or criticism. Sometimes, it’s by taking chances and some risks, that players really improve their game. As a youth basketball coaches, frequently players’ parents ask us about Summer AAU team opportunities, basketball clinic and basketball camp recommendations for their young basketball players. There are many choices to be made out there and sometimes it can be stressful for the parents as they determine the best course of action. In their eagerness to see their children advance their skills in basketball, many parents will make a big commitment – both in terms of dollars and time – to see that their kids have every opportunity to make improvements to their game. Are these types of opportunities worthwhile? Yes, they certainly can be. But, many players at the youth basketball level all the way up thru the NBA can take a different approach. 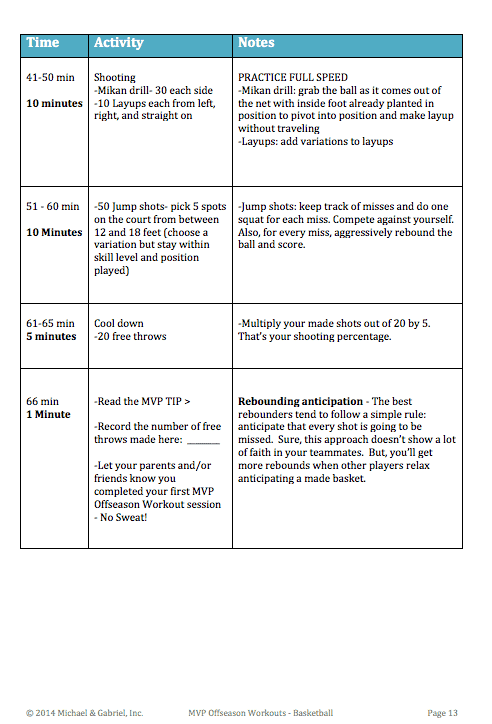 Individual offseason workouts are what we recommend first and foremost to parents who are looking for an opportunity for their kids to work on their basketball game during the offseason. Great improvements can be made to the player’s game and the financial commitment is minimal. At the NBA level, players like Dirk Nowitzki, Russell Westbrook and Kevin Love make a commitment to offseason workouts. After a short break upon the NBA season conclusion, they work hard at improving their game during the off-season. Sure, scrimmaging and 5-on-5 play is part of the equation, but the focus is on individual skill development. Players return to regular season teams with a new set of skills that takes their games to a new level. Maybe it’s better long-range shooting or improved post moves. It’s clear that offseason basketball training program can contribute greatly to a player’s next season performance. How the basketball workouts were designed? A Focus on fundamentals. We placed an emphasis on building blocks of what makes up a good basketball player because that easily transfers from one team to the next. Strong emphasis on ball handling and shooting. These are 2 critical areas that can be practiced individually in an effective manner and the offseason is a great time period to work on these skills. All-around player development. Youth basketball players shouldn’t just learn guard skills or just learn post skills. The best players are well rounded. They know how to do both types of skills. This makes them tough to guard. Shift activities quickly. By moving from one activity to the next quickly, it keeps players interested and enables players to work on many different skill sets. This basketball training program is designed to move at a brisk pace for an aerobic workout. want players to grow accustom to using different muscles and then as the plan progresses, we’ll ask for more repetitions or longer time periods. A fitness focus. Players play their best when they’re in shape. It’s hard to execute at the highest level if you’re tired, lack strength or are just out of shape. To address these needs, a part of each workout session includes general fitness exercises. Designed for an individual but can be used with a bigger group. One player on his or her own can complete the activities for these offseason workouts. However, workouts can be more fun with a workout partner or two. These plans will accommodate that. A whole team could workout together if there’s a big enough court area with multiple hoops. Plans were designed for healthy kids who have played basketball before. If you have any concerns about having your child participate in this type of basketball training program from a health perspective, consult with your physician. Kids should bring a water bottle to their court and drink water as needed. What do players need for these basketball workouts? Nolan McMonagle has coached multiple basketball teams for his local school and the YMCA. With a bachelor’s degree in Exercise Science from Central Washington University, he has worked alongside a Physical Therapist with a professional indoor football team. In addition to helping treat players’ injuries, he put them through exercise programs to enhance their performance. Mike O’Halloran has coached his 4 children on 15 different basketball teams. He created the Well-Prepared Coach™ line of sports books and has authored three basketball books. He is the founder and editor of SportsFeelGoodStories.com, selected as a Top 10 Blog for Youth Sports Parents by Blogs.com. His articles have been featured in The Post Game and on the home page of Yahoo.com. Players get pumped up for their workout sessions with an inspirational story and quote. Each workout session is 66 minutes long and begins with a warm-up. One of the best things about this basketball training program is that it’s fun. Two links will come with your purchase – share one with a friend.